In the fifth book of The Second Change series, Matt past is highlighted. He has a major secret that astonished Sarah Grayson. A strange girl comes to Second Chance and asked to see him. Later the girl is found dead and there is an eye-witness that Matt saw her. Matt denied seeing the girl. Sarah, Elvis and the Angels feel Matt is innocent. They begin to explore the facts of the case to prove it. Will they succeed before Matt is convicted of murder? I highly recommend this book and series. Disclosure: I received a free copy from Berkeley Publishing through NetGalley for an honest review. I would like to thank them for this opportunity to read and review this book. The opinions expressed are my own. 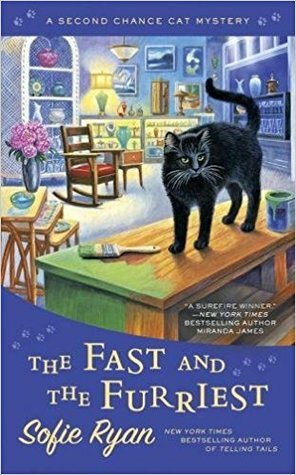 This entry was posted in #NetGalley, Books, Uncategorized and tagged cats, cozy mystery, Favorite, Matt, Sarah, Sofia Ryan. Bookmark the permalink. I don’t think I’ve read any of this series, I have to remedy that.